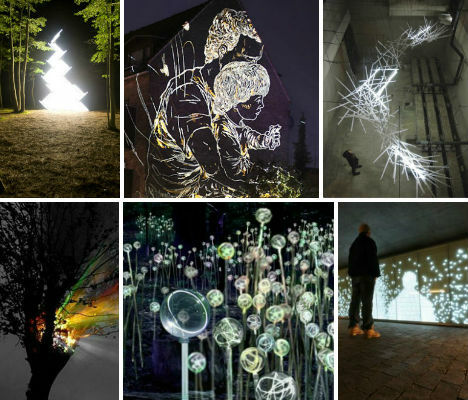 LED lights that respond to bodily movements, choreographed bursts of brightness emerging unexpectedly from a tree, fluorescent tubes arranged into chaotic but beautiful sculptures – these 14 light art installations are like the professional version of your neighbor’s holiday light show. 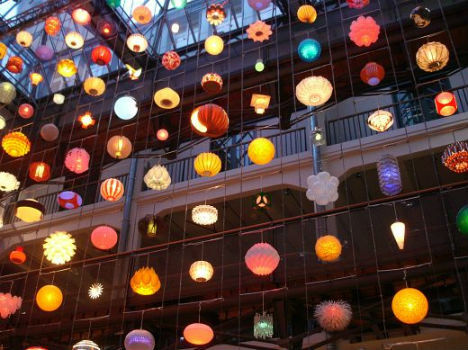 Artist Bruce Munro has produced some of the world’s most dazzling and attention-getting light installations in public gardens and museum lawns. 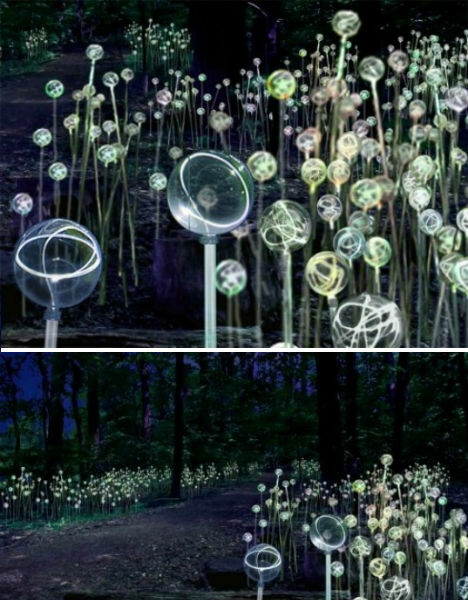 This particular project, consisting of glowing orbs connected by a series of fiber optic ‘roots’, makes for a surreal landscape at Longwood Gardens in Pennsylvania. Calling to mind alien plant life, the installation will include 20,000 individual orbs along a central garden path, and is set to debut in the summer of 2012. 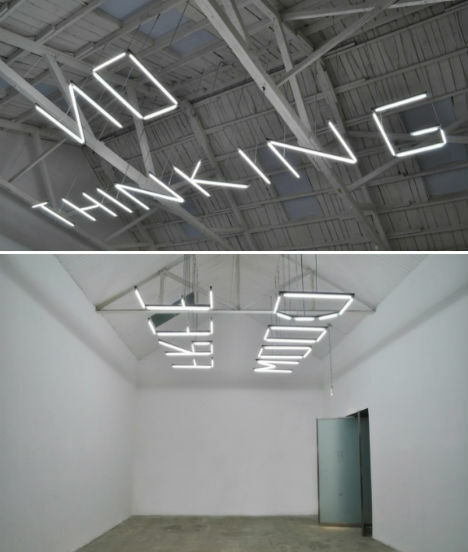 Chinese artist Ko Siu Lan created these fluorescent installations at Galerie Paris in Beijing for a spring 2011 show entitled ‘Don’t Ask Me Why.’ The lights spelled sayings like “Wood Free” and “No Thinking”. Fluorescent tubes may not make for the most attractive lighting, but when clustered into abstract, chaotic groups, they’re totally enchanting. 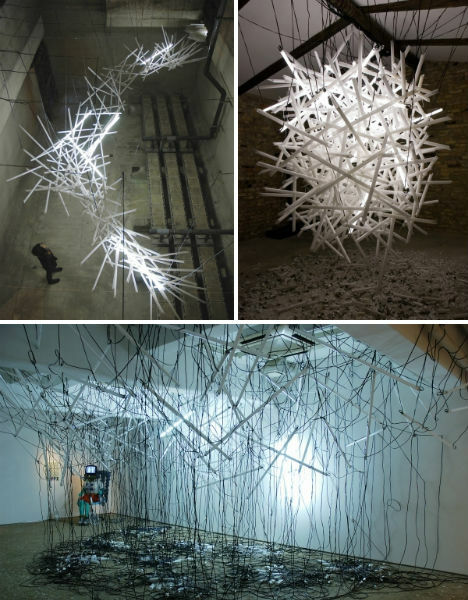 Artist Hitoshi Kuriyamahung hangs groups of them from the ceilings of galleries and exhibition spaces, with broken pieces of those tubes that didn’t survive installation littering the floor below. 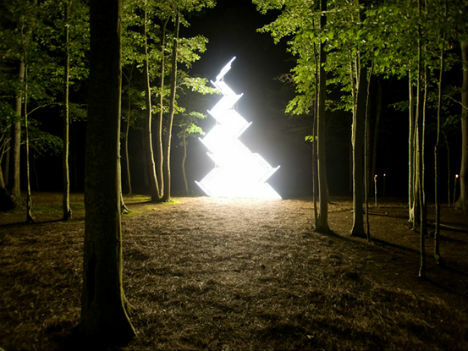 Danish artist Armsrock enraptured onlookers with this incredible light art installation series entitled Markinger in fall 2010. 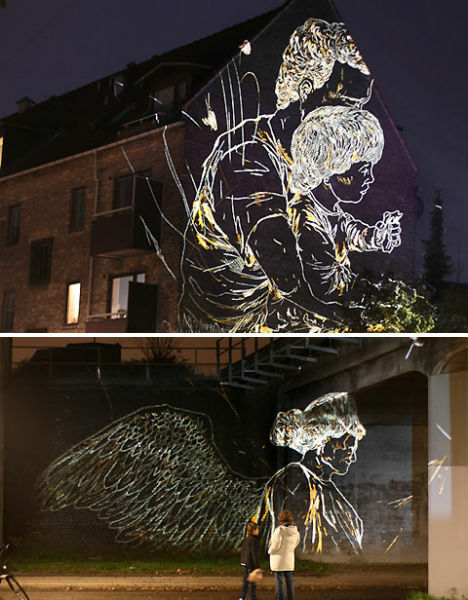 Armsrock created the temporary light installations by projecting engravings created with an etching needle onto the sides of buildings. 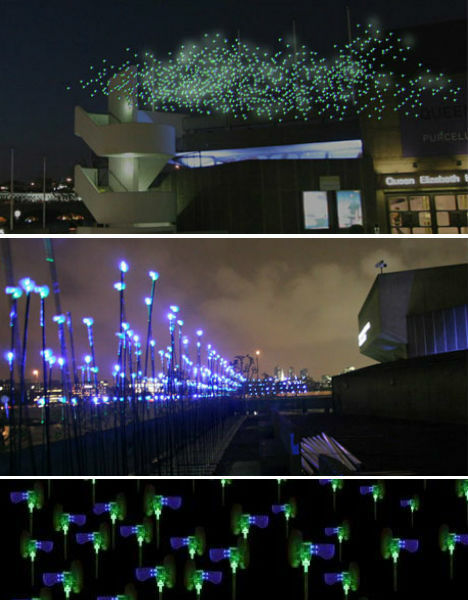 For Architecture Week 2007 in the UK, Jason Bruges Studio created an interactive light installation consisting of 500 miniature wind turbines which directly generate the power to illuminate hundreds of LED lights. The LED turbines, which were mounted on flexible poles so they could sway slightly in the wind, was a demonstration of the potential of wind power. In honor of her eightieth birthday, Gagosian Gallery organized a showing of artist Yayoi Kusama’s work, including ‘Aftermath of Obliteration of Eternity’. 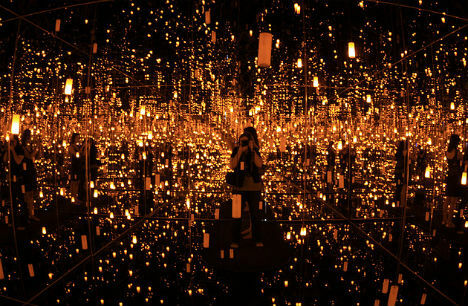 This mixed media installation is an ‘infinity room’ with all surfaces covered in mirrors, multiplying hanging lights so that they seem to go on forever and ever. 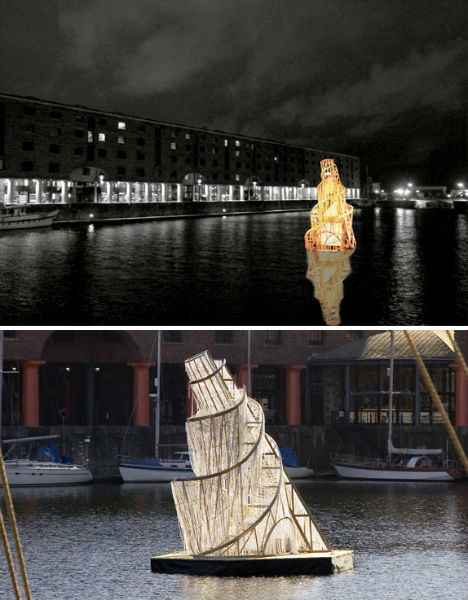 Famed Chinese artist and activist Ai Weiwei collaborated with Fake Studio to produce ‘Working Progress (Fountain of Light), an illuminated floating sculpture, in 2007. The installation was inspired by Tatlin’s Monument to the Third International, an unbuilt monumental building planned for St. Petersburg, Russia in 1919. 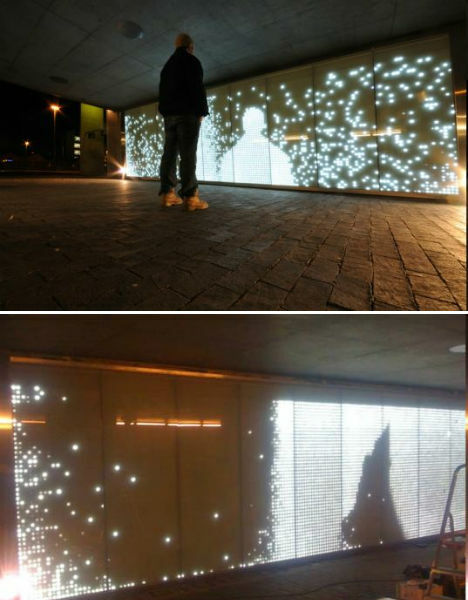 Turning shadows into light: that’s the purpose of the fun interactive exhibit of the Dobpler LED Wall, built for the European Capitol of Culture 2008 event in Norway. 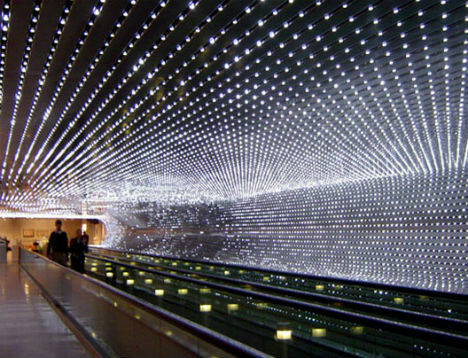 The wall was positioned in a pedestrian tunnel, where passersby saw their movements translated into patterns on the LED wall. Entitled Space Invaders 2008, this interactive light installation is comprised of a grid of 176 tiny lighting fixtures that react to the movements of passersby. 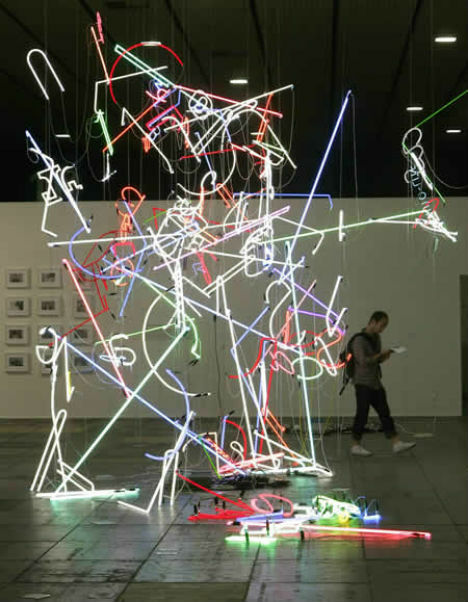 When someone walked in front of a video camera connected to the display, their movements were translated into adjustments to the intensity of the lights. Madison Square Park saw a similar interactive light installation in November 2010, a sort of hall of LED lights that adjusts in brightness according to the motions of people walking nearby. 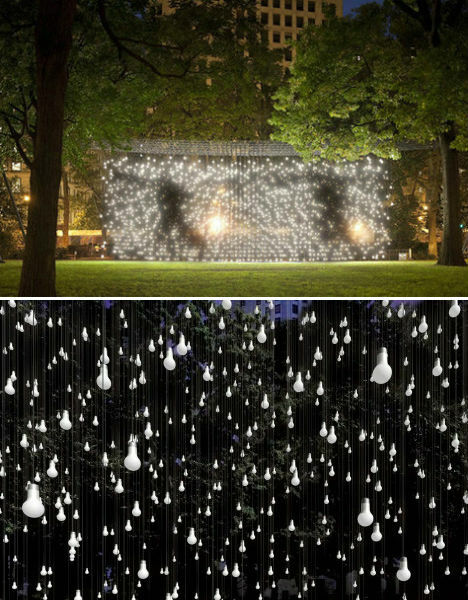 During the day, the installation reportedly didn’t look like much more than randomly placed bags of sand hanging from tracks, but at night, the exhibit – by artist Jim Campbell – created pixelated images. Artist Anselm Reyle created deconstructed installations for his first museum show in Denmark at ARKEN gallery in 2011. Looking like the still-illuminated detritus of the modern world, piles of partially broken neon lights share space with melted-down plastic and electronic scraps. “What interest me most are the dead ends of modernism,” Reyle says. Looking more than a little miraculous, rays of colored lights pour forth from the branches of a tree. 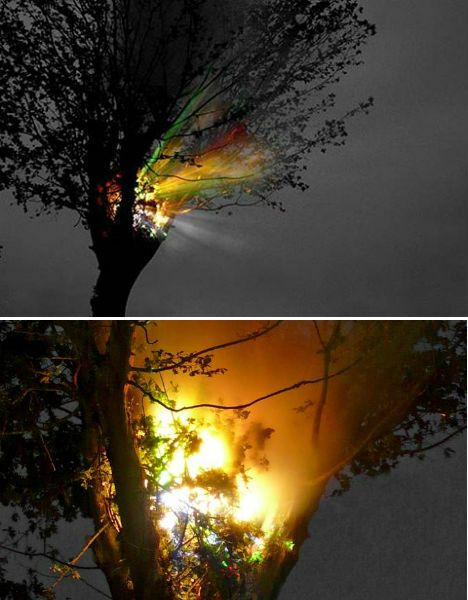 The project, entitled Nest One, is an installation by German-born artist Simon Huslein, who describes it as a woven sphere glowing at sunset, with changing colors that symbolize new life planted into a dying tree. 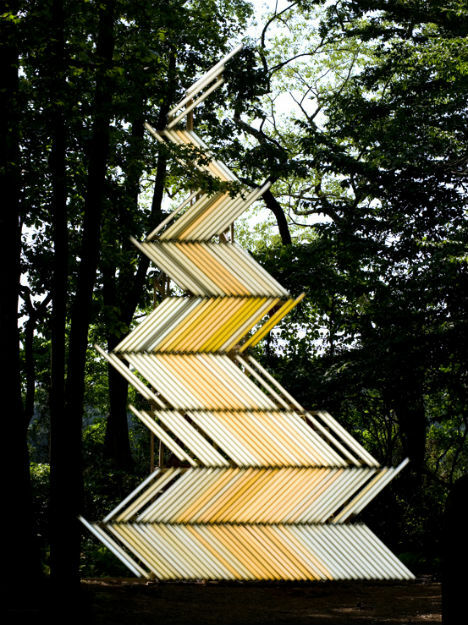 Israeli artist Yochai Matos used hundreds of fluorescent light bulbs to create the bold and geometric ‘Fame (gate), which – when seen from afar – almost seems to be a tear in reality, a crack giving us a glimpse at another world.